Two years ago today I decided to start a blog. I'm not entirely sure why. I had absolutely no idea what I was doing. I had left my job to stay at home with my daughter and my new lifestyle took a little bit of getting used to. But I bloody loved it. And I still do. One thing I did know was that I wanted to write about my new role in life as a parent - not in a perfect, Stepford Wives kind of way - I wanted to write honestly about all aspects of both pregnancy and parenting - the truly fabulous bits, the mundane every day bits and even the crappy and embarrassing bits. In the last two years I've written over 300 posts and had over 90,000 page views. 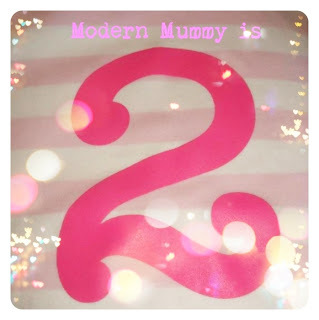 233 of you subscribe to Modern Mummy and lots more read on a not-so-regular basis. Modern Mummy has been nominated for four awards and won the LovedbyParents Blogger of the Year Award last year! If I'm entirely honest (and yes - a little bit hormonal) I have been completely and utterly blown away by the support and interest my little blog has received. 2 kids = expecting double the blogs. Good luck!